Physical: This is a rugged, elongate island which rises steeply from the sea to a series of pinnacles and humps. The shoreline is rock, rising directly from the water, except for a narrow boulder beach along the northeastern shore. Though steep, most of the upper slopes have a deep rich soil favourable for plant growth, and few vertical cliffs are present. Biological: The island supports no trees, and shrubs are not extensive. Rather luxuriant stands of dune wildrye grass cover many slopes, and salmonberry is present at the summit where the ground is nearly flat in a few places. Interesting plant records include leatherly (formerly leatherleaf) polypody fern, hedge-nettle, Indian paintbrush, western buttercup and hairy rockcress. Twenty-three species of vascular plants have been collected or observed. known to build and attend “dummy” nests. Black Oystercatchers and Pigeon Guillemots (176 birds) nest around the shoreline. Fox and Song sparrows are the most common land birds. A pair of Peregrine Falcons nest here; Bald Eagles have been seen in summer and may nest as well. The only land mammal is a large, endemic sub-species of the Deer Mouse. Harbour Seals are common around the shoreline. Rocks just outside the reserve provide a summer rookery for 800-1200 Steller Sea Lions. 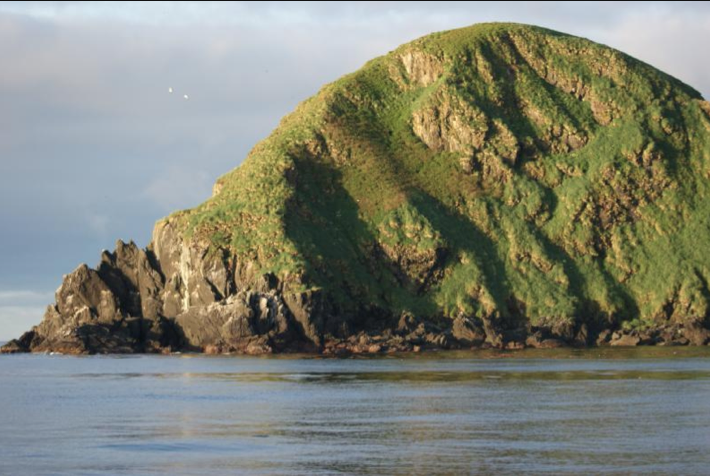 Three species of isopods, one millipede and two land snails have been collected on Sartine Island. It is likely Sea Otter were common in the surrounding marine environment prior to extripation. Occasional sightings are becoming more frequent indicating that Sea Otter are re-establishing colonies in this area. Climate Change: The IPCC has projected an increase in sea surface temperature and raised sea levels, both of which could result in changes in the presence and life cycles of marine species which are important food sources for the protected seabird populations. The loss of synchrony between seabird phenology and seasonal food source availability has already been documented on Triangle Island as the probable cause of Cassin’s Auklet breeding failures. Commercial and recreational fishing disturbs marine ecosystems and shorebird activity. Vessel traffic in the vicinity can be the cause of mortality in seabirds and marine mammals especially as the source of chronic oiling. Recreation: Close approach by marine or air traffic disrupts marine mammals and seabirds. Research Opportunities:Brief reports on seabird occurrence and abundance are available. Canadian Wildlife Service has surveyed vegetation cover. Environment Canada maintains a weather station on the island. The marine environment has not been inventoried. This site is ideal for continuing studies on climate change.